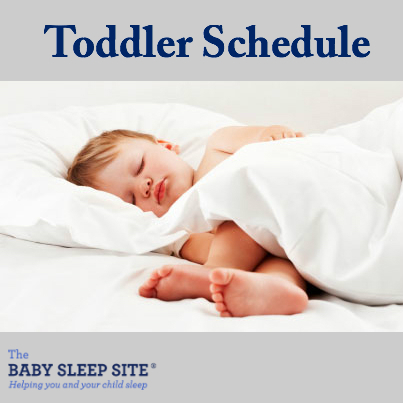 This article outlines the average toddler schedule, including feedings, naps and night sleep. If your toddler is having trouble napping, you may be interested in my toddler nap tips. And, for good ideas on feeding your toddler, check out Your Baby’s Start to Solid Foods. You may also want to encourage your toddler to get involved in his routine by teaching him to tell time with this Melissa and Doug Wooden Shape Sorting Clock. At this age, your toddler should be sleeping through the night, with no night feedings. Obviously, all babies vary, but here are some rough schedules you can use to make your own for your unique baby. I think of a “toddler” as a 1-3 year old, which is a wide range. Sleep needs change in that time-frame. While your one year old may be sleeping 12 hours at night and 2-3 hours during the day made up of 2 naps, on average, your three year old is likely starting to transition into not napping all together and will do so most likely before the age of four. At 2 years old, the average amount of sleep drops to between 12 and 12 1/2 hours in 24 hours, including just one afternoon nap. The average age for a toddler to transition to just one nap is 15-18 months. Transitioning too soon can have disastrous results with a very cranky toddler. This article will give an example of 3 different types of schedules, 2 naps, 1 nap and no naps. If your toddler is waking too early or going to bed too late, you may be interested in shifting his schedule. Looking for more sample toddler schedules? 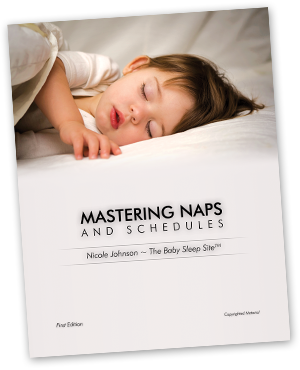 We have over 40 sample schedules for all ages in our e-Book, Mastering Naps and Schedules. Banish naptime battles and regain control of your day (and your sanity) starting today! Night Weaning Quiz: Is Your Baby Ready To Night Wean? Want FREE sleep help that you can put to use right away? 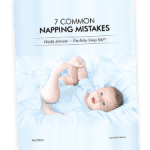 Download a copy of our free guide, 7 Common Napping Mistakes! The guide is available to download instantly, which means you can start using the techniques in it as early as today. So download now, and learn why your baby is not napping – and what you can do about it. Click here to learn more about how to get your free guide. A better daytime schedule could be just a few clicks away. So don’t wait – download now, and start your journey to better napping today! What is your toddler’s schedule? Share below! Need Toddler Sleep Help? We Have the Resources You Need! If you are tired of wading through stacks of sleep books that just aren't working, if you are beyond exhausted and just can't solve your toddler's sleep problems on your own...than personalized sleep consulting is for you. We have been around since 2008 and invite you to tap into 10+ years of experience. Our team of expert consultants will create a Personalized Sleep Plan® just for your family and then support you through every step of implementing your plan. We encourage you to consider our personalized, one-on-one baby and toddler sleep consultation packages if you want to see real, meaningful results now. Your consultation package also includes ample follow-up help, designed to help you troubleshoot problems and tweak your plan as needed. Looking for budget-friendly custom sleep help? Enjoy customized sleep help that works without breaking the bank! Our Express Sleep Plan® is customized to fit your toddler's unique sleep needs and to work with your parenting style and goals, and it's also priced to work for even the tightest budgets. It's also available instantly - just complete a brief questionnaire, submit your answers, and your Express Sleep Plan® is ready to download in moments! Grab your Express Sleep Plan® today! 1) do we do the sleep training thing with the 19 month old and it ends up being similar to cry it out, since she’s obviously older than a 6 month old, will it give her abandonment issues? 2) if I did end up purchasing a sleep consultation, will I get to discuss both kids? I know I didnt provide too much, but any advice without needing to purchase a consultation would be appreciated. 1. There are lots of different methods that include crying, but it does not have to be let her cry for hours and hours and hours without offering any consoling in between. I know that’s a hot debate about if it causes abandonment issues and I’m not going to pretend to know the answer to that one. My perspective on sleep training is that I am teaching my child a valuable skill they will absolutely thank me for later. I shower my kids with hugs and kisses and praises, but I am also firm with the things that come to health and safety, and sleeping falls into that category for me. (That’s my off the record mom-to-mom answer for ya!) I can also say I’m thankful my kids didn’t put up too much of a fight so I never had to have that internal struggle, but I will let you know our consultants try to give a more gentle approach first, they understand that there’s not a one size fits all answer to sleep training and it may need to be tweaked based on the temperament of the child. 2. If you purchase a consultation and want help with both kids, you can of course get it. We do require you pay a one time sibling add-on fee to get advise on both. If your 3 year old isn’t having any really big issues leaving you with specific questions that you need addressed, then you wouldn’t need the sibling fee. You can also contact us directly at contact@babysleepsite.com and we can recommend a package, explain how to add the sibling, and answer any other questions you may have from there. I hope this helps! My son will be 2 in May wakes up at 7 takes a nap for about 1.5 or 2 hours goes to bed at 7 and wakes up around 10 like it was a nap! If I don’t give him a nap he is cranky but I thought it would help him sleep better at night but it just makes our day horrible. Hi @Elizabeth – Thanks for writing to us! I am sorry that your little guy’s schedule is “off” right now! Waking at 10pm ready to go is tough! I do think that you’re right that he still needs a nap to get through the day, and hopefully adding the daily nap back to his schedule will help, and help him sleep better at night too! Keep being consistent, and encouraging him to go back to sleep even if he does wake at night. For additional help, I would recommend that you consider our e-Book, The 5 Step System to Better Toddler Sleep. It is written specifically to help parents of toddlers with sleep issues. The book includes a number of detailed sample schedules, as well as an explanation of the various sleep coaching methods you can try at home, with your toddler. It also contains several sleep planning worksheets and sleep logs. I hope that things smooth out soon! Good luck!!! My toddler is 2.5, and was sleeping great until we transitioned him from a crib to a twin bed. Now he’s up several times at night, and often needs me there to go back to sleep – which can take 2-3 hours for him to fall back asleep, only for him to wake up 3 hours later. To add on he’s also decided to stop napping all together – regardless of how I try to encourage the nap. So we now have a super exhausted toddler that really fights sleep – not to mention an overtired mama. This has been going on for almost 2 months, any advice would be greatly appreciated! Something that has been personally helpful to me was the OK to Wake clock which I purchased off Amazon. It lights up when they’re allowed to get out of bed. I got it when my son was your son’s age, and we still use it now and he’s almost 4.5. There are a lot of options on there so please email us at contact@babysleepsite.com if you have any questions! I hope this helps! Additionally, I’ll just add that around 15 months my son turned from the happiest baby ever, to quite a miserable piece of work (if I’m being kind). I felt like I was going crazy and I was so frustrated all the time, and then felt guilty for being mad at my baby. Turned out he was cutting 6 teeth at the same time! Yikes! We also had some big transitions happening at that time (we sold our house and were living with family) so I don’t know if any big things are changing for him, or if he’s cutting any teeth, but I know teething and big life changes really changed my toddler for a while. Thankfully he’s back to normal (well he’s cutting his 2 year old molars now, but we are so close to being done) now and is my sweet happy boy again. I hope this helps, or at least provides some comfort to you that I totally understand how challenging it can be. You are not alone! I’m new to this and don’t know if this is an open forum for the comments section, but I have a suggestion. My girl 15 months as well has slept through the night since she was born… she struggles when it comes to naps as in she refuses to nap. Anyway, my girl loves music, she even dances to commercials, that said I have a CD from one of the personalization companies (not an ad) but it says her name throughout the good morning song. I play it every morning and we dance or i hold her and we sing it. It makes her happy and it gives us a bonding moment at the start of her day. Our little girl is turning 2 in a few days and we’ve been working on her sleep (going to sleep mostly) for 14 months!!!! We used the timed method successfully when she was around 10 months but at 11 months I ended up in a parent infant unit with bad PND and she completely regressed. We’ve been trying the in/out method (go in at peak distress, calm then leave) for months but our strong willed little girl is still trying to control the situation, eg. She throws her comforter out then cries for it or hides it under herself then cries for it. For some reason she’s great for her naps. She’ll sit in the cot and read or talk to herself for however long and then fall asleep on her own but nighttime is a whole different ball game! Do you know why this would be? We used CIO last night for the first time and she was hysterical for 45 minutes then finally went to sleep. We’ve literally tried everything and feel this is the only way to ensure she has no control. We’re hoping it works!!! Hi @Belinda, thanks for writing to us! I’m sorry you’ve been struggling so much but I’m glad you did see some success last night! I had to resort to CIO with my strong-willed child too for the same reasons you mentioned. Now he goes to sleep far easier than my other son (that is much easier in every aspect, haha). You are teaching her a valuable skill she will be glad she has later, for sure! I hope the good nights continue! Hi. My nephew is over 3 years old and still struggles to sleep through the night. He would wake up at night and walk to his parents room and bed at any time of the night, sometimes he would fall asleep instantly some other times he would ask for being rocked or wouldn’t fall back asleep again. From what I know he had a sleep routine. My sister is desperate! Does the typical sleep training work at that age or not anymore. Hope this helps, and good luck to you both! Thank you for your comment on The Baby Sleep Site! I’m sorry to hear you’re having so much trouble with your toddler’s sleep, but being the parent of a now 3.5yo who climbed out of the crib at 19 months, I feel your pain! Our consultants can definitely help with this issue, and in fact, it’s a pretty common one, so you are not alone! If you need help figuring out which consultation package is the best fit for your family, please email us at contact@babysleepsite.com and we’d be very glad to help. Good luck! My son is just about to turn 1 and has been a catnapper his whole life. He started sleeping through the night at about 5.5 months with the help of solids & some sleep training (11-12 hours, thank God) but his catnapping has continued (despite the same sleep training). He’s been on 2 naps for a while but still only for between 30-50min (the former when at daycare 2 days a week). He’s always been grumpy when he wakes & the days he naps at home we go into his room before he wakes from the 1st cycle & resettle him, which usually gets him through to the 1hr10-20 mark (this doesn’t work at daycare for the carers). I’m writing to ask whether you think teaching him to sleep independently will help him sleep more during the day (we don’t care how much longer, as long as he’s able to sleep as much as he needs/wants), & whether he’ll naturally lengthen his nap once he drops down to one? My worry is that he’ll just do 1 x 30-60min nap all day when he gets to that & that bedtime will be way too early. The sleep training we tried at 5.5months was CIO at the insistence of a nurse – results were: worse day naps (15min naps!) & better night sleep (sleeping through). We then just patted him to sleep in his cot which is what we still do until now, & is how we resettle him during his day naps. He does seem quite dependent on it for his sleep though. @Michelle – Thank you for reading and for commenting. Managing a toddler’s schedule can sure be tricky – especially at this age – so we understand your pain. Generally, we find that sleep does consolidate and lengthen once kiddos learn to sleep independently though this can take a bit of time as you work consistently on his sleep. Please let us know if we can be of any help throughout this process as we regularly work with families of toddlers on improving day and night sleep and would love to work with your family as well. Hang in there, Michelle! Hi. I have a 20 month old who sleeps 9:00-7:00 and usually takes 1 nap from 1:00-4:00. However on Monday and Wednesday, I have to take my 3 year old to school and pick her up at 11:15 and my 20 month old falls asleep in the car. He gets fussy off and on throughout the day and I was wondering if this schedule needs to be adjusted for his age. Any advise would be appreciated. Thanks! Hi @Sarah, thanks for writing to us. I feel you on the struggle of car naps!!! They are such a disaster aren’t they? It is certainly a challenge and you may find as your baby gets a bit older he will adjust and be able to stay up a little longer and will make it for the drive. You may consider an earlier bedtime if your family’s schedule allows to get him some extra hours in the 24 hour period, which may help with his fussiness. If you need any extra help, let us know! We are happy to help.